The Cambridge Judge Business School is now inviting project proposals for its 2018 MBA programme “Cambridge Venture Projects”. These market analysis projects are carried out for corporate clients over 6 weeks in Oct-Dec 2018 by a team of 5 MBA students who are professionals with an average of seven years’ work experience from over 40 countries. Clients consistently report on the high quality and insight of the project work. If you are a company with a product, treatment or service that would benefit from ‘real’ market analysis from a team of bright and resourceful MBA students, the Judge Business School would be delighted to hear from you. Organisations would normally be local to Cambridge or London but can be further afield provided they can commit to attending the client briefing on 11th October and the final presentations between 3-6 December at the Judge Business School. 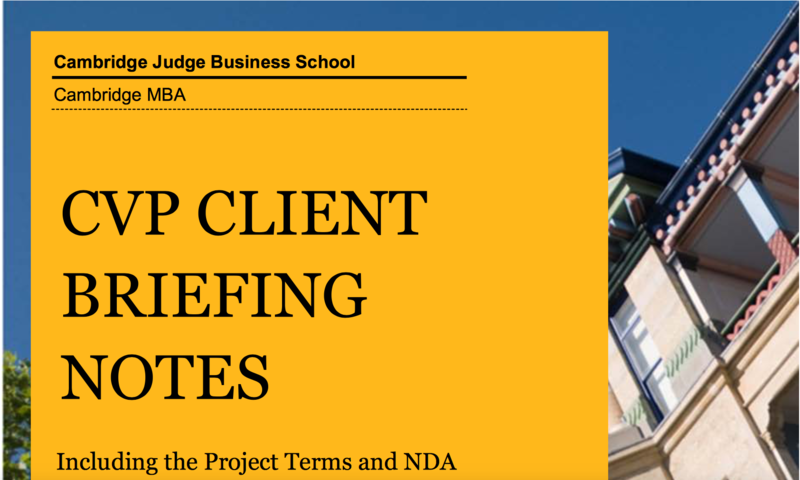 Clients should be appropriately available to the project team, assigning a sponsor and another point of contact who should be available over the duration of the project to guide and advise the students and respond to any queries in a timely manner. More details about the projects, expectations and how to get involved can be found in the briefing notes here. Proposals should be submitted here by 5th September. If you have any queries don’t hesitate to contact the Business School directly at mbaprojects@jbs.cam.ac.uk or on 01223 768387.